Wedding Cakes with a Difference! We are all familiar with the traditional wedding cake although some have become quite modern over the last few years offering a different cake in each tier! Well here's something a little different, a cheesecake, made with tiers of different cheeses. Sheridans Cheesemongers have been creating wedding cheese cakes for several years and they now supply hundreds of cheese cakes all over the country each year. They pride themselves on only supplying the finest quality and value Irish and Continental cheeses. 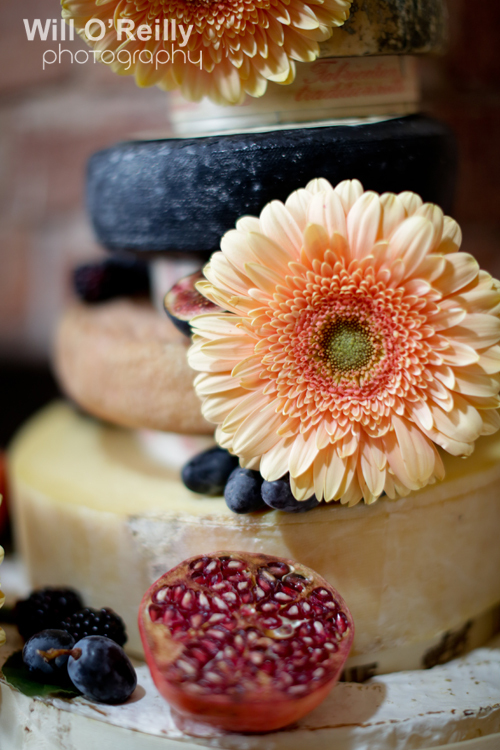 For your big day, you will get the best advice and value from an experienced award-winning cheesemonger; the Irish market-leading wedding cheese cake specialist. 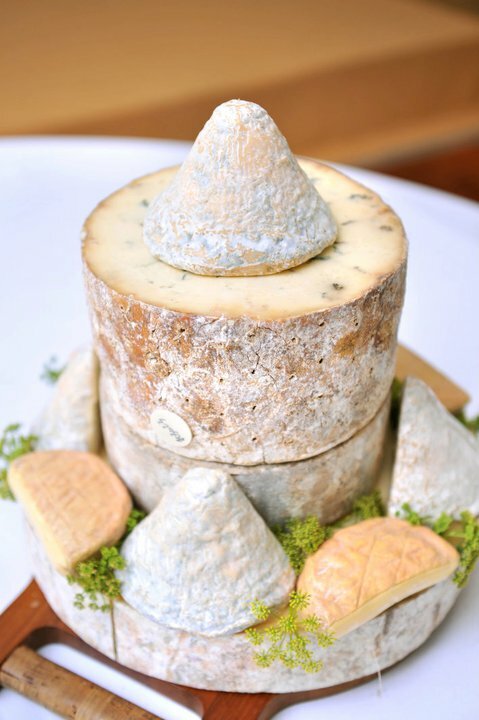 Celebration cakes made from cheese are becoming increasingly popular both here and abroad. It’s not a cheesecake. 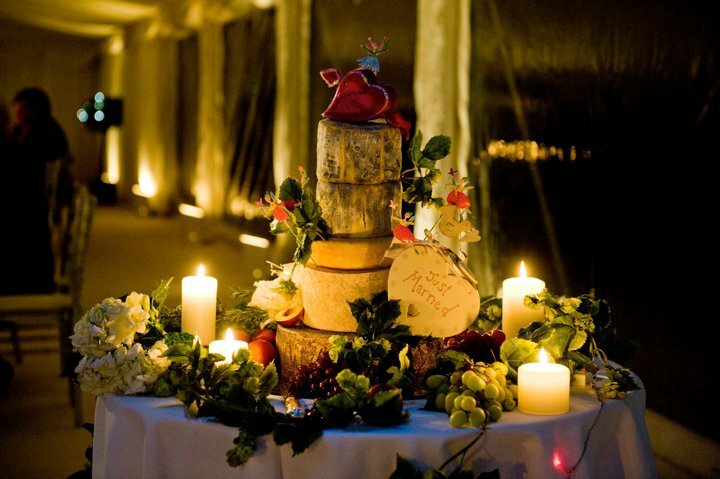 The basic idea is that - either as an alternative or in addition to the traditional tiered cake - guests are presented with several cheeses which have been stacked one above the other and decorated to resemble a classic wedding cake. To make it look like a traditional cake, round cheeses of decreasing diameters are used. 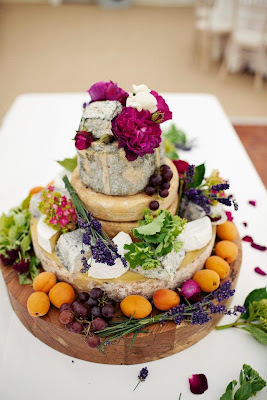 This 'cheese cake' is later disassembled and used as the cheeseboard - an after dinner option which many people prefer to traditional wedding cake anyway! 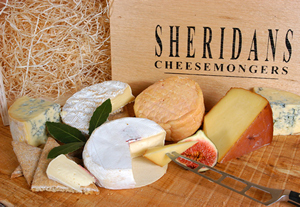 Sheridans offer lots of options, ideas and advice on choosing your cheeses. You can keep it Irish or they can cater for any other preference that you may have. Once you have your cheeses selected you can assemble and decorate them anyway you like. The pastry chef wherever the reception is being held will usually be only too delighted to decorate the cake for you. Or find someone artistic to garnish it in an attractive manner ( you will probably be too busy on the day!) Everyone has their own personal ideas. Seasonal fruits are a great way to add the finishing touches to your cake. Foliage, fresh figs, green/purple grapes, flowers, and even some figurines all seem to work well. If you are worried about cut flower or leaf stems touching the cheese, wrap the stems in a little clingfilm or foil. Many customers have also added some chutneys and pickles to go with their cheeses. One of our brides last year and a wonderful cheese cake made!